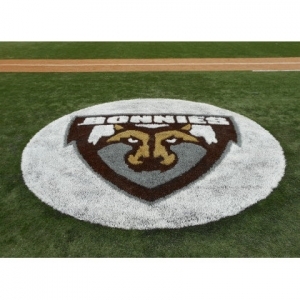 Custom Turf Outlet is happy to provide all willing batters with a spot on their custom on deck circles! When you’re the next man or woman up to bat, you can’t just trot out of the dugout and find a spot in the dirt to take warm-up swings. There should be a designated spot – a spot that highlights your school or organization. Custom Turf Outlet specializes in artificial turf of all kinds, and is completely dedicated to making sure all customers are satisfied with their on deck turf and that all batters are ready to step up to the plate! Specializing in artificial turf only makes the job easier when it comes to custom on deck circles. Just send a digital file of your logo, and we’ll get to work on transforming your brand into a spot where batters get warmed up. There’s also no need to worry about the hassle of coming to pick the turf up or hauling it all the way back to your facility – we’re happy to ship it right to your doorstep for free!